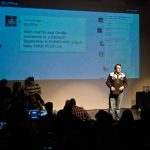 Before Facebook Live & Periscope we were devising comedy formats driven by audiences on social media. 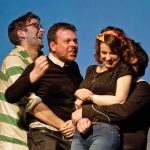 Cuff was a night of live improvised comedy hosted by Jared Christmas and featuring, Cariad Lloyd, Humphrey Kerr, Michael Legge & Tom Rosenthal. We re-installed the wifi network at The Notting Hill Tabernacle, hired a large Twitter Wall & invited 300 people, all of whom had to have their phones on and join in by Twitter or SMS as the gig progressed. Cuff was not streamed, simply filmed, edited and then shown to TV Commissioning & BBC Three. Funding was then secured to create a streamable pilot from the Hospital Club. By then the ask was to make it feel more like a studio led event than a stand up show. We brought TV presenter & stand up Ian Stirling into front this and paired him with Comedian & former software developer Sanderson Jones…playing in character comedians, musical acts & YouTubers into the mix. 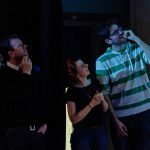 Audiences were invited via Facebook with permission to use their data on the show whether they were watching online or in the audience from the Hospital Club. The plan was to grow a comedy experience from the web to TV. 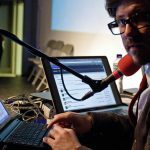 I wanted to create a weekly live streamed, community based gig into iPlayer and then flip to BBC Three on TV when it had grown its audience. Unfortunately TV Commissioning felt otherwise and so the idea of live social comedy gigs on bbc.co.uk went away. Perhaps Facebook will bring them back?